Despite advancements in agricultural technology, farming is still a dangerous occupation. During National Farm Safety and Health Week, September 18-24, Safe Electricity is sharing tips to help farmers have a safe harvest. Look up and look out for overhead power lines. Being aware of the location of overhead power lines and planning a safe equipment route can help reduce accidents. During harvest season, many farmers reap the benefits of advancement in agricultural technology. With the help of GPS auto-steer devices, farmers are able to decrease driver error and maximize productivity. Yet despite these advances, safety risks remain. September 18-24 is National Farm Safety and Health Week, and to help farmers stay out of harm’s way, Safe Electricity shares tips for a safe harvest. GPS with auto-guidance provide farmers with real-time, accurate location data about a field, which can be used for crop planning, map making, navigation assistance, and machinery guidance. During harvest, this technology allows drivers to have their hands off the steering wheel as the combine maneuvers itself through the field. Thanks to this technology, farmers can more easily and efficiently maintain accuracy even during low light conditions, which enhances productivity. Putting safety first requires alertness, focus, and knowledge of potential hazards and safety steps. Varying pass-to-pass accuracy levels and potential issues, such as power poles not being correctly plotted in the system, reinforce the need for drivers to stay focused on the location of the farm equipment while in the field and to be ready to take action if necessary. Keep equipment at least 10 feet from lines at all times, in all directions. Always set extensions to the lowest setting when moving loads to prevent contact with overhead lines. 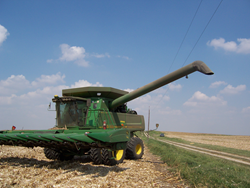 Grain augers should always be positioned horizontally before being moved. If a power line is sagging or low, contact your utility. If equipment does make contact with a power line, do not leave the cab. Immediately call 911, warn others to stay away, and wait for the utility crew to cut the power. The only reason to exit equipment that has come into contact with overhead lines is if the equipment is on fire, which is rare. However, if this is the case, jump off the equipment with your feet together and without touching the ground and machinery at the same time. Then, still keeping feet together, hop to safety as you leave the area. For more information on electrical safety, visit SafeElectricity.org.